To complete an online membership application form, select the appropriate membership level from the list below. Contact FPPA Headquarters for more information! Any firm or corporation who is engaged primarily in business as a commercial manufacturer of flexographic printing plates and not associated with converting operations. Firm or corporation which is a supplier of products or services to flexographic pre-press platemakers but do not engage in the flexographic pre-press platemaking activities. Any flexographic converting company supplier of other than pre-press related products (for example: Ink Supplier; Analox Roll Supplier; Press Supplier). Trade press membership is available to a firm or corporation, which is engaged in the publication of periodicals of interest and related to commercial manufacturing and use of flexographic printing plates. 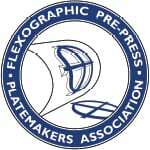 Academic membership is available to bona fide educational institutions, or representatives thereof, whose interest in the flexographic printing plate manufacturing industry is recognized by the Board of Directors. We know where we stand as an industry today, but what about tomorrow or five years from now? FPPA members will face the challenges of tomorrow together. The association's insistence upon full compliance with all legal requirements in the antitrust field is based on the association's conviction that the preservation of a free, competitive economy is essential to the welfare of the association, the industry it represents and the country. To become a member of FPPA, select the link to call up the membership application form. Fill in the form and select "submit". An information packet will be sent to you.